Everyone needs a paper weight on their desk if for no other reason to have a personal message engraved on it that reminds them how important to the company they are. These paper weights come in many different materials and designs to meet almost any need including gold plated metals. Crystal star paperweight. 7/8" thick optical crystal. Individually gift boxed. Crystal paperweight with black silk screen. Laser engrave only. Packaged in satin-lined, padded gift box. This 2-3/4" x 4" x 3/16" thick crystal is beveled on the edges and flat on the ends for a unique design that reflects the light. 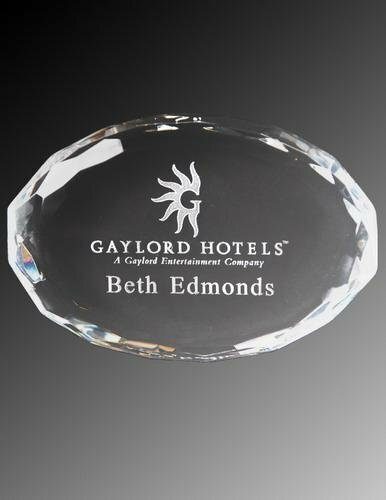 Personalize this crystal for an elegant, functional award. This premier crystal is packaged in a velvet lined gift box. The exquisite cut and shape of this glass Bottle Cap Paper Weight is a replica of the real thing! Facets cut all around this diamond shaped crystal paper weight make it sparkle and shine like a genuine diamond. Personalize this elegant piece for a stunning and functional recognition of excellence in achievement. This premier crystal is packaged in a velvet lined gift box. Facets cut all around this beautiful paper weight give it the sparkle of a genuine diamond. This slanted piece has a flat back, so it can be personalized on the front, or from the back for a more 3 dimensional look. Anyone would be pleased to be recognized with this stunning, functional award. This premier crystal is packaged in a velvet lined gift box. Diamonds are everyone's best friend. Casting fantastic highlights, this faceted optically perfect crystal diamond will become a great friend. Magnify a logo or message by etching on the bottom of this 24% lead crystal dome. The optical crystal Faceted Gem Paper Weight is the perfect corporate gift for any occasion. Phone: 304.363.4754 Toll-Free: 800.296.4754 Fax: 304.363.4777 Powered by BizWizard ShopKart by NetSoft Studio, LLC.